With the announcement of an upcoming sequel to Shadow Complex, I thought I would post an old review of mine for the original game. 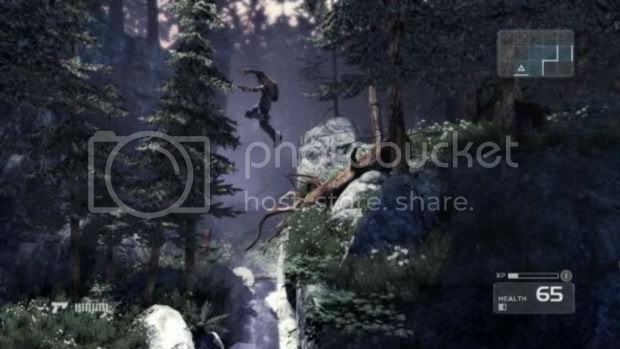 Shadow Complex, developed by Chair and Epic Games, was released on the Xbox Live marketplace for 1200 MP’s. The game won awards at E3 and looked like a trip back to the old metroid side scrolling days except with a 3D twist. Unlike Epic’s previous games, it did not look all that bloody. However, after seeing the footage it just didn’t seem to captivate me as much as it seemed to captivate the audience. Then I played the demo, and ended up shelling out money for the game. If you are worried about spoilers I promise not to give out any spoilers except for the ones that happen within like 10 minutes of playing the game. 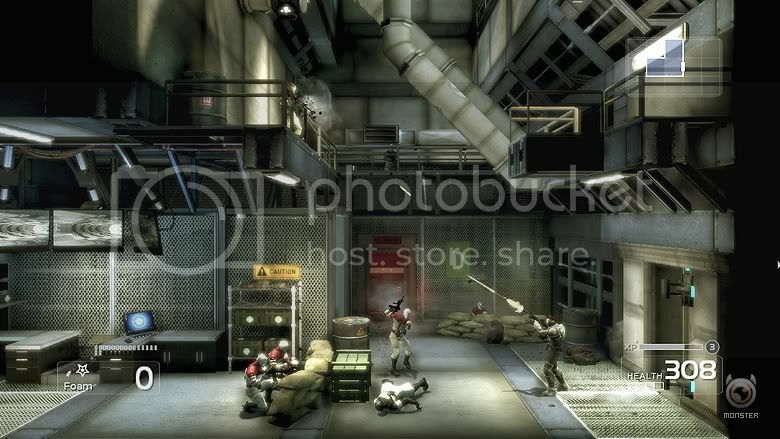 Shadow Complex is a game that is supposed to serve as a medium between Orson Scott Card’s novel Empire and the sequel Hidden Empire. I have never read the books but luckily they did a good job presenting the game with not a lot of facts but enough to where you can understand who antagonists are. The story starts you off as some random guy, whether they said his name or not I can’t remember, who has gotten a prototype suit. All you know is that the Vice President of the United States of America is being attacked and there is a gun fight between the Secret Service and the Progressive Restoration, the bad guys. Using the prototype suit you stole from the PR you get into the fray and proceed to kill all the evil doers. 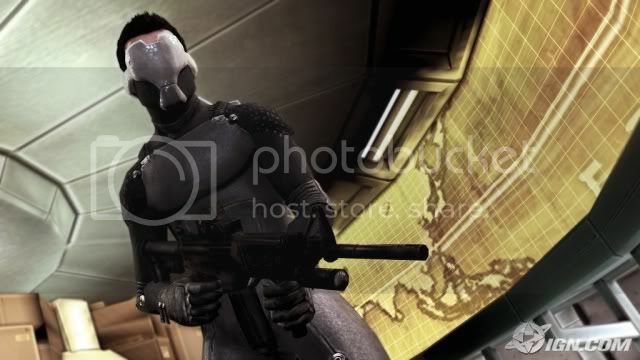 However after the firefight an explosion occurs killing the Vice President and a voice comes over your suit and takes back control where you are knocked out, or you might have died, one of the two. Meanwhile in a different area Jason and his girlfriend Claire, who after some dialogue implies that this is their first date, are hiking around the forest where they stumble upon a cave. Claire seeming adventurous decides to explore the cavern and goes on ahead of you. Jason heads down but when he hits the bottom all he can find is her backpack. After progressing and finding a fully automatic door in the cave, you hear Claire being dragged away and into the door above you. It is then that Jason heads through after her and stumbles upon a massive a military complex. Your objective is simple from here, rescue Claire. The plot of the story is pretty good, with a secret organization that somehow has a surprising amount of weaponry to battle the United States. Although I said it did give us some facts that wouldn’t leave us in the dark I wish they could have given us a motive as to why they are doing this. Are they religious? Do they just want their won country? Are they just douche bags doing it for the hell of it? I don’t know because the story didn’t tell me. But all in all that is just one tiny nit pick I had. One problem I did have with it was the dialogue. At times it was just down right stupid. You know how in cartoons where they something like, “Well at least (something really bad) didn’t happen…” and then it ends up happening? I bring this up because in the first level right after you beat the PR to save the Vice President, and you lose control over your suit, the guy says, “well at least the Vice President is safe”, at which point the explosion occurs of course killing the VP. But the dialogue is at its shittiest when it gets overly romancy. Take Jason and Claire, it’s their first date and they’re already like, “Come over here cutie” and the other will reply, “Okay cutie”. After those scenes, dialogue seems pretty normal, but I most certainly cannot give it any credit for dialogue. 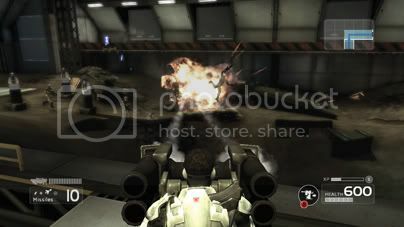 Shadow Complex mirrors the early Metroid games for the Nintendo and Super Nintendo Entertainment Systems. That is definitely not a bad thing as you get slight nostalgia from the game as it reminds you when Side scrolling games were all the rage. It is not the side scrolling aspect that makes it reminiscent to Metroid, but the other aspects. Over the course of your journey through the complex you will come across doors that you cannot open unless you have the right equipment. Your equipment to help you with these barriers and help kill your enemies is many from a type of foam that freezes your enemies to missiles and much more. So how does one go about carrying Foam, grenades, and such? Well the game, once again being like Metroid, provides you with a super suit, the one from the beginning. The pieces to the suit are missing, so you acquire each piece separately, giving you something new to play with. My personal favourite was the friction dampener allowing you to go at super fast speeds to break down walls. The game places a huge aspect on exploration. Players will find themselves coming back to previously explored areas, not just to get to the next objective, but to explore and open areas that were previously unreachable. While the game does not force you to explore, exploring sure does help, and who wouldn’t want a ammo capacity for their missiles increased or more health? Normally I don’t go OCD for finding items, but with this game I just felt a strange urge to constantly go back to the very beginning and just search every nook and cranny for some sort of obstacle just so I can get an Armor upgrade. It did a really good job at rewarding the player for going off the beaten path. So what happens when you are exploring and you forget where you need to go? This will not happen as the game shows the area where you need to go along with a blue line that shows you how to get there. The map also shows doors that can be opened with current equipment by giving it a certain color. Although it is like a Metroid game, it does innovate in some areas given the current generation we are in. Take the flashlight for example. In games like metroid you had to figure out what walls could be broken or lay down mines aimlessly, hoping something opens up. With the flashlight, not only does it luminate dark areas but highlights obstacles with a certain color that shows what you need to break it. For instance, some rocks shine red indicating you need missiles to break it or vents shine orange showing you just simply need to fire upon it. Along with the flashlight the game adds a certain 3D twist to the game. While Jason can only move side to side enemies will be able to move not only side to side, but also come towards you or move farther. They will also be able to shoot at you from areas that aren’t exactly straight in front of you. But don’t worry you are not defenseless, the game allows you to shoot not just forward but into the background as well, and it makes it easier to aim on the background enemies with a decent auto locking system. Despite the auto lock system, the aiming can still be difficult at times. Since it utilizes the right thumb stick as the aiming button, getting that headshot can sometimes be more trouble than it’s worth. Several times have I found myself taking so long to get my sight in the right area of the head that they enemies notice me causing me to not only lose my shot, but some health as well. Along with enemies moving into the background, the game shows more by switching it up when you get into a turret. When side scrolling the camera will immediately change to a third person view when you activate a turret. With both the enemies able to move from or into the background and a good turret affect, the game certainly separates itself from most 3D side scrollers. 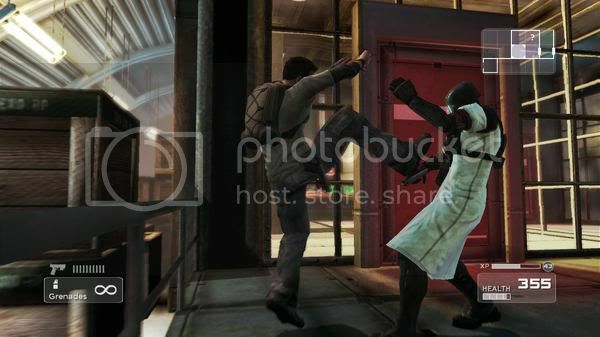 Shadow Complex adds a sort of stealth to proceedings. When I say stealth I don’t mean like Metal Gear Solid, but it allows you to skip certain battles if you need to. Say there are a bunch of enemies, and my health is at 10, if there is ladders above me I can simple jump up to it and silently get by without having to fire a bullet. However don’t expect these to be in every room of the complex. 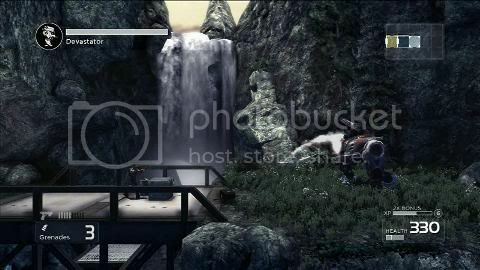 Shadow Complex also has a leveling system. Defeating enemies and leveling up are some ways Jason can gain experience. Every level awards Jason with something new such as an armor upgrade or boosting basic functions such as running faster. The level cap is 50, and you may not necessarily gain 50 levels through one play through. Do not fret, when you start a new game you will get to keep your current level and the attributes that have come with it, but you will lose the weapons and equipment you have found. Besides the campaign, players will also get Proving Grounds. Proving Grounds is set up like a sort of simulator with colorless walls and enemies and appears to be used to test the prototype suit. In Proving Grounds the player can not use the equipment they have gained, they must use the equipment and abilities the simulator has proved them with in order to complete the challenge. The challenges on Proving Grounds are a set of obstacles that the player can pass to get high scores. Don’t expect to find anything too difficult as the Proving Grounds are mainly meant to for speed runs and to test how well the players can use the abilities that are provided. Besides Proving Grounds the game also sets up a very subtle sort of competition. These are displays as the overall campaign score. Besides the campaign score, there also is the high scores for most people punched or most shots to the head. A better example of this is to tell you of my experience. While playing, I decided to use a melee move to knock the guy out, after I did, a small box appeared on the corner of my television showing the scores. I had one melee kill under my belt while the person ahead of me, I think it was Wubzu, had 80 kills. Once you surpass the person ahead of you, the game will show you the next person ahead of you who has the most amount of melee kills, or headshot kills, or whatever you are aiming for. The controls for the game are very simple being an Xbox Live Arcade game. As mentioned above, the right stick aims, and the left stick move the character. You can select different equipment with the D-pad. And you shoot your rockets or grenades with the Right bumper. It is your average control scheme, nothing new, cant say I had any problems with the controls. Gore splattered walls and intense amounts of blood are what we have come to expect form Epic, but this time around they did things differently. Surprisingly, there is no blood. Whenever you shoot a guy they appear hurt and clutch their chest but no blood is spilled, so its kid friendly. The graphics for this game look very much like Undertow and the bionic commando game for XBLA. The graphics are pretty crisp and the environments are well rendered, you get the sense that they even made the areas look good from behind, even though you can’t see it, this shows when you enter the turret, but I already talked about that. Players will also notice that whenever you shoot a wall, part of the wall will pop out while you’re shooting. 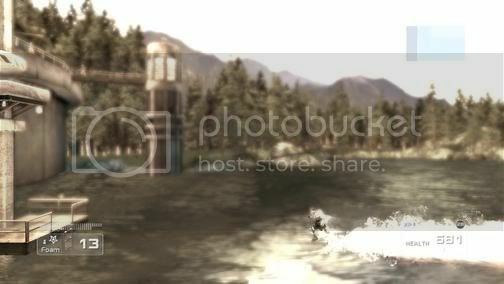 Or whenever you shoot at the water, it actually splashes. This surprised me for XBLA game. But for some reason, whenever you threw a grenade into the water, there was only a small plash that was only slightly bigger than a splash caused by a bullet, and the sound for the grenade splash wasn’t all that realistic. The sound is alright. I got the feeling that the guns in the sounded the same, except just faster than the last. As I just mentioned the grenade sound wasn’t all the great when it exploded in the water, nor was the splash sounds. However, when under water and you fire your gun, the sound does sound somewhat realistic as the there is no loud BLAM sound but more like a silent suppressed gun. So I can’t say the sound was a complete train wreck as they did get some parts right and others not so well. The environments in this game do have a tendency to mimic the last room. In total I think there is about 5 sectors in the complex. Don’t get me wrong they look really well done, especially the forest area. But in the complex even though there are 5 sectors the rooms look the same as the last sector and not a whole lot of diversity was added to rooms for the most part. As far as music goes there is none except for the end credits and the Menu. Each song sounds kind of like Bioshock music and then turns into some war tune. It’s alright, but the game could have had a low scale tune for the game instead of the silence. Shadow Complex is not quite a unique side-scroller shooter, but definitely has its moments and has the end result of a fun game full of nostalgia for the kids who had an SNES or NES. It has a very simple control scheme and a well polished look with its 3D scheme. Once you beat the campaign, trying to find 100% of the items, and completion of the Proving Grounds obstacles, will get players coming back for more. I say this game is a buy, 1200 MP is a very good price for a such a fun game and made me want to pick up a copy of the book Empire. Disclosure: Community member Games247 bought a copy of Shadow Complex and reviewed it on a Xbox 360. For more information on what our scores mean, plus details of our reviews policy, click here. This entry was posted on Thursday, September 22nd, 2011 at 12:00 and is filed under Reviews. You can follow any responses to this entry through the RSS 2.0 feed. You can skip to the end and leave a response. Pinging is currently not allowed.